Refreshingly, The Buffs Club is full of punters tonight, which makes a change from some of the low-key affairs I’ve been involved with this past week in Edinburgh. Up onto the stage bounces the irritatingly handsome Charley Rowley, our chirpy compere for the evening. He’s here to demonstrate what the Newcastle University Comedy Society Showcase has to offer this year, preaching to a crowd composed mainly of like minded students. Things get off to a good start, Charley engaging in good natured banter with the audience, skilfully making sure everyone is in the right mood. The London born comedian has a nice line of amusing anecdotes to bolster his routine, a cautionary tale about a late night drunken trip to McDonalds being the highlight of the performance. After an extended period of warming up we are introduced to our first comic proper, Scouser Mark Smethurst taking his place on the mic. Smethurst is a cheery, irrepressible raconteur, dispensing a variety of humorous stories focussed around his madcap father. When he isn’t describing an impromptu waxing session with his Dad (just as dodgy as it sounds), he is laying into his clipped-accented compere, lambasting Rowley for dipping into the stock market when they should be tucking into a post night out kebab. Acknowledging that Giggle Beats is in the house, Smethurst riskily signs his own death warrant, as his set then loses momentum; “affable” being the verdict here. Alan Fletcher cannot be with us tonight, so it is up to the striking figure of Nick Cranston to fill the middle slot this evening. Hearing aids strapped to the side of his head, Cranston begins with a hilarious visual gag about his disability. His offbeat, slightly surreal act is of an exceptional standard for a free show, and tonight the audience hang on his nuanced delivery. A final story about buying U-rated DVD’s is a treat, the act a short and sharp injection of hilarity before the final performance. Jonathan Pelham is upset. The So You Think Your Funny? 2012 runner up has been offered unwanted NHS treatment for his facial disfigurement, in his words meaning he has been “diagnosed as clinically ugly”. His measured, self deprecating set has a few big laughs, the end result of a school dance humiliation putting a neat, dark twist on the conclusion of his act. I was, however, anticipating a little more from a comedian clearly tipped for higher things. Perhaps it was an off day, or the time limit hampered him slightly, but this highly praised newcomer didn’t quite hit the heights he is clearly capable of. 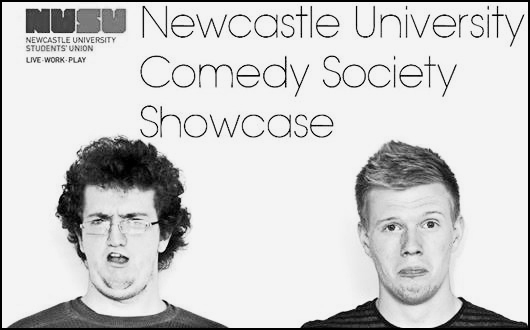 The Newcastle University Comedy Society Showcase is an involving, interesting platform for four talented comedians to show Edinburgh their wares. Though by no means perfect, the potential on offer puts many paid shows to shame. Bigger things should follow in future years. Date of live review: Wednesday 22nd August 2012.